My organization, Equitas – International Centre for Human Rights Education, held a small reception this evening in recognition of donors who contributed to a fund we created for our Haitian alumni following the devastating earthquake in January. A few people apart from the staff showed up: members of a choir that has some Equitas staff members among its singers, board members, and friends and relatives of the organization’s staff. We were also privileged to have among us the Haitian participants who are taking part in our organization’s massive International Human Rights Training Program (IHRTP), an annual event now in its 31st year which brings together over a hundred human rights educators from around the world for a three-week training. Also present were two former Haitian participants, Jean Joseph Alfred Gibbs and Patrick Camille, who are returning to the annual program as co-facilitator and facilitator, respectively. The get-together was a simple but significant opportunity to say thank you for donating. There was a message from the board’s president, Rob Yalden, who was genuinely touched by the generosity of those who donated. Another board member, Thérèse Bouchard, who has worked for years with civil society in Haiti, also offered words of gratitude. 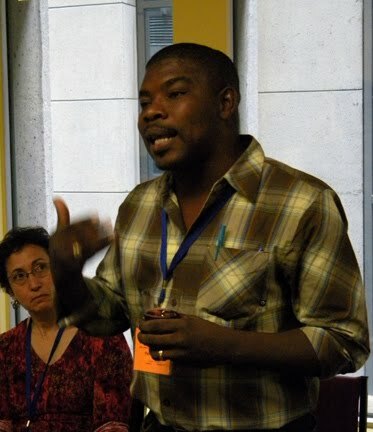 Our Haitian facilitator Patrick spoke next, and eloquently spoke of the transformative effect the IHRTP had on him. By the second week of the training he attended in 2002, he realized that the training was not simply on international standards, laws, and mechanisms, but was about who we are as human beings. The program affected him deeply where it mattered most: in his heart. It’s a message that left a mark on him and reinforced his conviction that teaching about human rights is so much more than teaching about what the rights are: it’s about what we value. A focus on values has guided our organization’s recalibrated efforts in Haiti, and thanks to two recent visits in the field by my colleagues, value-based human rights education is taking root with the alumni who have been part of our programs. He answered for us a question every donor asks, no matter what the contribution: how was the donation used? Even though the amount raised didn’t rival the hundreds of thousands or millions of dollars raised by other organizations (but Equitas is not a fundraising organization, we do human rights education), every dollar made a difference. He recounted the words of one recipient: “Yesterday, I had no water. Today, I can drink.” There is no gesture too insignificant. Patrick was kind enough, as were so many others tonight, to recognize the contribution of my younger son, who donated most of the money he received from his birthday to the Haitian alumni. My son then proceeded to quietly make his way to the centre of the room and wave, and for a brief moment my heart swelled with pride. I told a friend earlier today that, at my son’s age (he’s seven), I would not have donated my birthday money the way he did. Taking the train home with both my sons, they told me how happy they were to have attended this small reception. In an age where disasters – either natural or caused by our own hands – seem to dominate the headlines, it’s reassuring to know that there are people out there who are willing to help in whichever way they can. Colleagues and board members donated, as did their friends and families, as did the schools they visited or the choirs they sang in, and believe me, it does make a difference. Even if your donation gives a family water to drink for a day, think for a moment how appreciative they will be. Any contribution that brings people out of misery and enables them, for however brief a moment, to live in dignity, is a gesture that gives me hope. Some final thoughts were spoken by Equitas’ executive director, Ian Hamilton, who aptly remarked: “It’s not the time for reconstruction in Haiti, but rather the time for construction.” And that means that we cannot and should not forget those still living there, suffering. Photo of Patrick Camille courtesy of Daniel Roy. It really was a nice event yesterday evening. Two of my friends who had contributed attended and they were very moved to meet Haitians to whom they had donated directly. One of them handed me another envelope of money she continues to collect at her place of work. We are a small organization, but the way we continue to work closely with our alumni and partners on their ground and according to their needs resonates with people here who genuinely care about the dignity of others. It was indeed very moving. I caught myself having to hold back tears a few times. It made me really happy that my colleagues set-up the initiative.